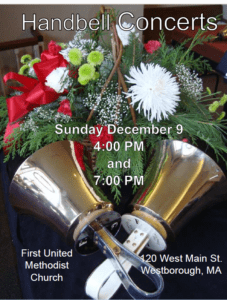 Westborough – The handbell choirs of the First United Methodist Church of Westborough, 120 West Main St. will present a Christmas Handbell Concert on Sunday, Dec. 9 at 4 p.m. and 7 p.m. Under the direction of Cynthia Hamburger and Alice Morrison, four handbell choirs will be performing arrangements of familiar Christmas music, and original handbell pieces. The Good News Ringers and Praise Ringers are the adult choir. Joyful Sound and the Carillon Ringers are the youth choirs. The Carillon Ringers will only perform at the afternoon concert. 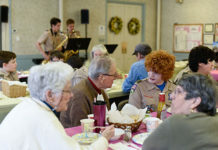 The Good News Ringers, members of AGEHR, is an established group and have rung throughout New England for over 30 years. The church is handicapped accessible and listening devices are available. There is no charge for admission, although a free will offering will be accepted to support the music programs of the church. Refreshments are served afterwards. For further information contact the church office at 508-366-4910 between 9 a.m. and 2 p.m. weekdays.